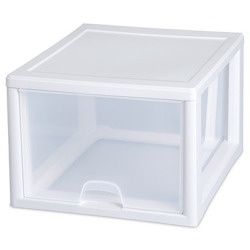 Sterilite® 6 Quart Stacking Drawer with White Frame | U.S. Plastic Corp. 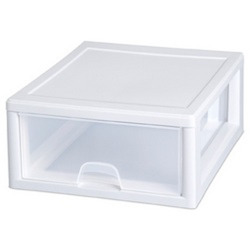 The 6 Quart Stacking Drawer is an ideal solution for organizing shoes, as well as other small items. 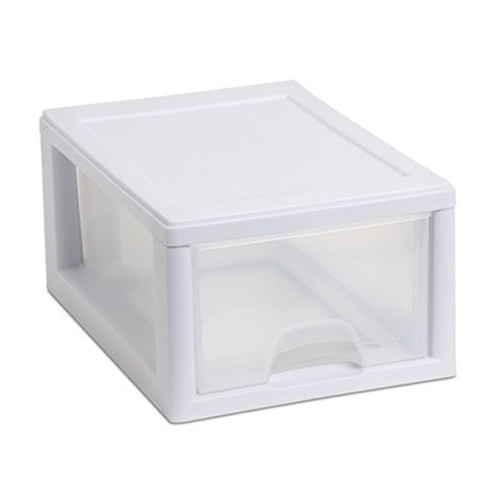 The comfortable handle allows the drawer to be pulled out easily, and drawer stops prevent the drawer from sliding all of the way out of the frame. Multiple drawers stack on top of each other, creating a modular and customized storage solution. 12-7/8" L x 8-7/8" W x 6" Hgt.